mmsonline.com September 2017 MMS 81 FEATURE the possibilities. He'd seen it on YouTube. Fittingly, the first paid job for the new machine came from posting a picture of it on Facebook. Since then, the sequence for most par ts has been initial roughing followed by high-rpm, high- feed, shallow-cutting-depth and light-stepover machining with progressively smaller ballnose end mills. Shrink-fit toolholders from Haimer help e nsure f ull f i ve -sid e d ac c e s s to wor k pie c e s gripped by 0.08-inch dovetails in fixtures sup- plied by 5th A xis Workholding. The advantages of this approach go beyond the direct impact and the ripple effects of reducing setups. "Even if a part could be done on a three-axis, a five-axis allows you to tilt it up 15 degrees," Mr. Ickler says. "When you surface with ballnose tools, that leaves more of a mirror finish." Technology isn't worth much without the skills to run it, he adds. For instance, after joining the team little more than a year ago, one of Chris Graham's early contributions was developing and troubleshooting the fixturing and programming necessary to fit a large automotive oil pan on the five-axis machine. CLIMBING HIGHER That kind of creative programming and fixturing is critical to winning work. 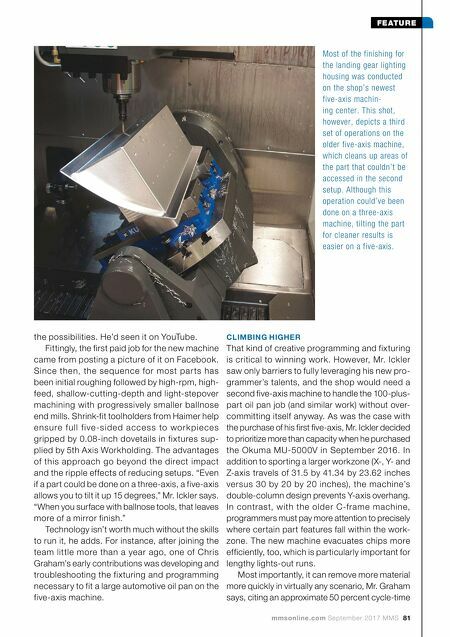 However, Mr. Ickler saw only barriers to fully leveraging his new pro- grammer's talents, and the shop would need a second five-axis machine to handle the 100-plus- part oil pan job (and similar work) without over- committing itself anyway. As was the case with the purchase of his first five-axis, Mr. Ickler decided to prioritize more than capacity when he purchased the Okuma MU-5000V in September 2016. In addition to sporting a larger workzone (X-, Y- and Z-axis travels of 31.5 by 41.34 by 23.62 inches versus 30 by 20 by 20 inches), the machine's double-column design prevents Y-axis overhang. In contrast, with the older C-frame machine, programmers must pay more attention to precisely where certain part features fall within the work- zone. The new machine evacuates chips more efficiently, too, which is particularly important for lengthy lights-out runs. 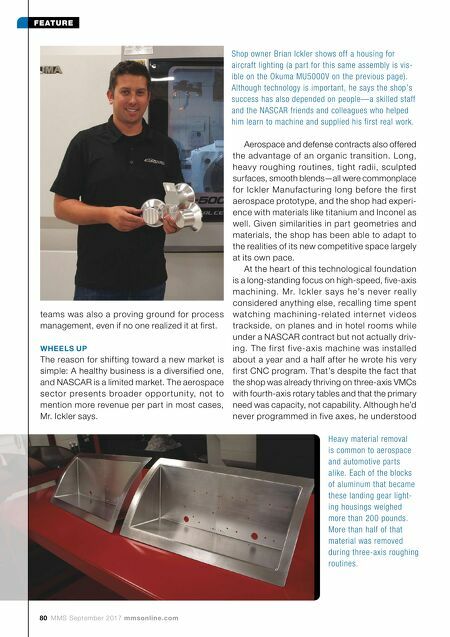 Most importantly, it can remove more material more quickly in virtually any scenario, Mr. Graham says, citing an approximate 50 percent cycle-time Most of the finishing for the landing gear lighting housing was conducted on the shop's newest five-axis machin- ing center. This shot, however, depicts a third set of operations on the older five-axis machine, which cleans up areas of the part that couldn't be accessed in the second setup. Although this operation could've been done on a three-axis machine, tilting the part for cleaner results is easier on a five-axis.